WareOut is the PUP that uses misleading techniques to prevent removal. Use Reimage to locate malicious components and get rid of them faster than with uninstall instructions. A full system scan blocks virus reappearance and prevents traffic to malicious domains. WareOut – rogue anti-spyware. Why? How does this rogue work? How does WareOut scareware spread? How to remove WareOut virus? Is your PC continuously loading a doubtful system scan powered by WareOut? Does it work abnormally? Are you receiving a strange-looking alerts warning you about critical security errors? Is your PC running much slower than it used to before? Then the culprit of these problems may be WareOut (also known as WareOut.exe, spyware.Wareout) virus, which is a serious cyber threat known as rogue anti-spyware. WareOut is a misleading name, so you should not fall into trusting it blindly. Although, from the first glimpse, this tool may seem like a professional anti-spyware, it’s NOT true at all. In reality, it has been classified as a rogue anti-spyware and belongs to the high level of cyber threats. WareOut virus pretends to be a legitimate anti-spyware to scare people into thinking that their PC’s are severely infected by the virus, malware, Trojan and other threats. The answer why it does so is simple – it seeks to earn easy money. Upon a success infiltration (distribution methods will be explained in the next paragraph), WareOut rogue roots deeply into the operating system and starts jeopardizing the system. It installs itself on a Windows startup, starts running several malicious processes via Task Manager and corrupts Registry entries. After that, this fake anti-virus starts loading the scheduled system scanners and reports about various infections lurking in your PC’s system. 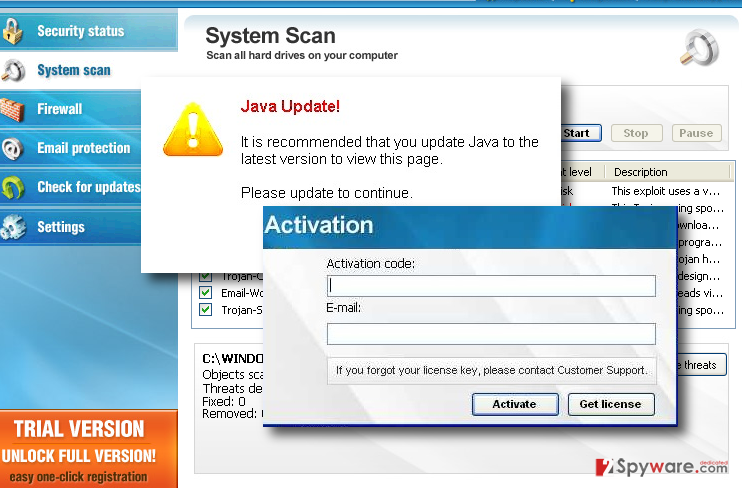 However, WareOut does NOT have a virus database, what means that all viruses it warns about are invented. Usually, this threat selects random files from the system and report them as malicious. Of course, it offers to remove all the listed infections, but for that you will be urged to purchase a ‘full’ or ‘licensed’ version of WareOut rogue. Please DO NOT buy it because this will only lead to money loss. On top of that, removal of the listed ‘malicious files’ can lead to critical computer issues while disclosure of your credit card details to cyber criminals can cause further thefts from your bank account. Therefore, the best solution, in this case, is WareOut removal. Unfortunately, this task is not that easy. This pest may not allow you to perform its removal neither manually not automatically. Luckily, using Reimage or another professional anti-malware can help you. If you cannot load any anti-malware, you should go to the Page2 and find steps that you have to take to activate legitimate anti-spyware. If you have found that your PC has been affected by WareOut malware, you should run a full system scan with a reputable anti-spyware and remove all malicious files. Otherwise, you may find more viruses on your computer. Before you do so you should update your anti-spyware. If you need a detailed guide explaining how to do that, read this guide. When trying to remove this threat, our recommended programs are Reimage and Malwarebytes MalwarebytesCombo Cleaner because they can easily detect every hidden component that belongs to this and other cyber threats. Now right click on IE or other browser’s icon and select Run As or Run As administrator. Enter your Administrator account password (if needed). Take another computer that is not infected by this virus and download Reimage to it. Let WareOut start its work and finish its fake system scan. Download SpyHunter and remove malicious files that belong to WareOut. This entry was posted on 2015-11-26 at 02:13 and is filed under Rogue Anti-Spyware, Viruses. You can quickly scan the QR code with your mobile device and have WareOut manual removal instructions right in your pocket. How did you remove WareOut?